YUM! Check out these deals! Whether you like cheese, pepperoni, or veggies on your pizza, you won't have to pay full price on Saturday! 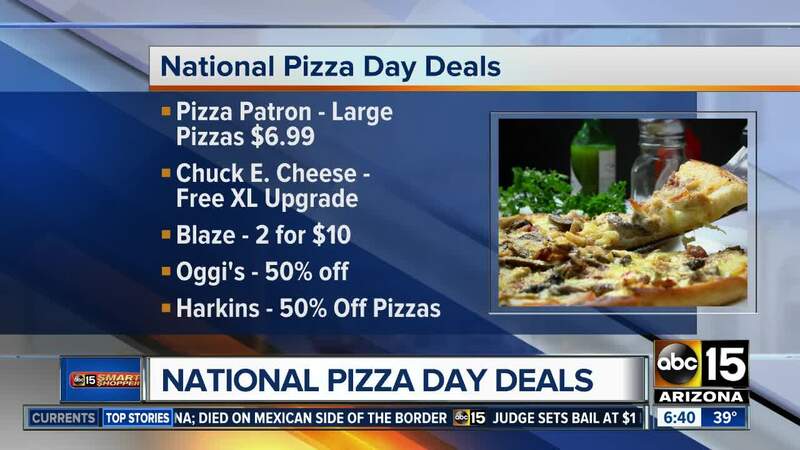 Saturday is National Pizza Day, and that means you can save some dough at retailers all over the Valley. At Pizza Patron , get any of their large specialty pizzas for $6.99 on Saturday. The regular cost is $10. At Blaze Pizza , $10 is what you'll pay for two pepperoni pizzas when you order online. Oggi’s Pizza in Glendale is offering half-off all of their pizzas. At Chuck E. Cheese , the deal is happening right now and goes through Saturday! Use the promo code "4860" at the register, and get a free XL upgrade when you order a pizza of any size. Harkins is celebrating National Pizza Day with 50 percent off their pizzas for My Harkins Awards Members. That deal is also happening right now, and it's valid through Sunday for as many pizzas as you want. Uptown Alley in Surprise is offering a special dish -- a large 16” pizza will be topped with sausage, steak, bacon, pepperoni, mushrooms, onions, peppers. It will be $25. There are so many pizza joints around the Valley, just ask if your favorite spot is offering a deal. Chances are, even if it isn’t exclusive to National Pizza Day, you won’t have to pay full price.